bl.uk > Online Gallery Home	> Online exhibitions	> Asia, Pacific and Africa Collections	> Cinnomon [sic] bush, Ceylon. Photograph by Frederick Fiebig from an album of 70 handcoloured salt prints, of a cinnamon bush in Sri Lanka (Ceylon). 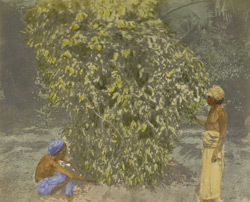 Fiebig, of German origins, was active in Calcutta as an artist and lithographer in the 1840s. Little is known about his life, but turning to photography in the late 1840s he produced hundreds of photographs by the calotype process, frequently handcolouring them. His photographs of Ceylon, probably taken in 1852, are considered the earliest surviving photographic record of the island. While Sri Lanka is well-known for its tea export today, historically it was cinnamon which was closely associated with the island. The botanical name for the spice, cinnamomum zeylanicum, is derived from the former name of the island: Ceylon. The spice is obtained from the scented inner bark of a tree and European colonists were first drawn to the island of Sri Lanka in order to exploit the natural cinnamon crop. Between the 16th and mid-19th centuries Sri Lanka supplied all the cinnamon used in Europe. Costly wars were fought over it between Portugal and Holland and it became the main article of trade for the Dutch East India Company. The Dutch were so keen to preserve a monopoly of this spice that they passed a law in 1659 which made buying or selling wild jungle cinnamon an offence punishable by death. Small commercial groves were planted from 1770 onwards once coastal areas of Ceylon were conquered. By 1840 the cinnamon trade had declined and the government which owned the plantations offered these ‘gardens’ for sale. Today Sri Lanka is still the leading source of the world's cinnamon, providing it with the choicest grades of the spice. The cinnamon groves and gardens are concentrated in the north-western and south-western coastal regions, north and south of Colombo, the commercial centre. The tree in its wild state grows up to 20 ms high but the seedling is ruthlessly pruned at two years of age to produce "tillering" - a profuse, bushy growth of bark-yielding twigs.